ADD UPDATE, 14 February 2018: Although ADD is fiercely politically neutral, it reserves the right to speak out when a politician of any persuasion talks complete nonsense about local issues. 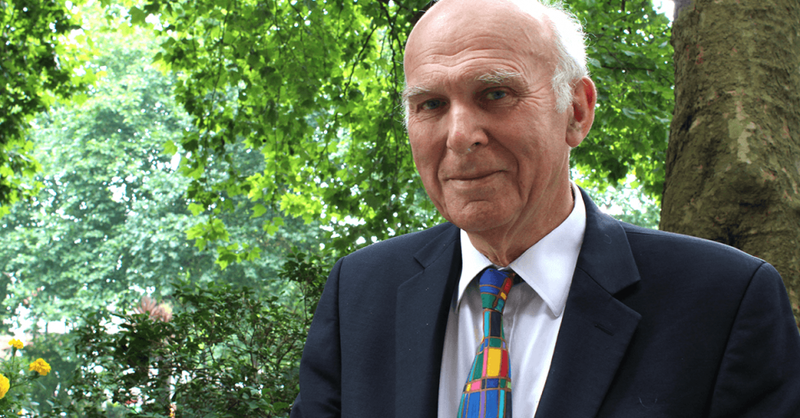 On a visit to Eastleigh last week, Liberal Democrat leader Sir Vince Cable made some outrageously misleading comments about the council’s plans to submerge the villages of Bishopstoke, Fair Oak and Allbrook and wreak havoc on the natural environment. Cable is an honourable man, but we do not imagine that he has had time to study the borough’s Local Plan and the evidence (or lack of) to support it. We can safely assume that, when he spoke to the Daily Echo, he was repeating in good faith what he had been told by party colleagues in Eastleigh. In other words, he had been sold a pup. So, let’s look at what he told the Echo about the Local Plan: “The basic strategy is to build ambitious housing developments combined with a good environmental policy. My understanding is that they [the council] are trying to create garden villages to protect the green land between Eastleigh and Southampton. Cable backed up these quotes with a tweet, no doubt written by someone else, that said “Now big #housing push within #greeninfrastructure meeting local need”. 1) He says there is a desperate need for new houses, but he is aware that the council is planning to build nearly two thousand more than are actually required, and does he approve of this? 2) Is he aware that the “green and sensitive” development he refers to will destroy over 800 acres of prime countryside, which his own council’s research has identified as being by far the most environmentally sensitive in the borough, leading Chris Packham to brand the plans as “eco-vandalism”? 3) What does he say to the Woodland Trust who have warned that the plans would cause serious and permanent damage to seven areas of ancient woodland? 4) What does he say to the Angling Trust who are up in arms about the extensive damage the plans would cause the River Itchen at a spot so sensitive that it is protected at a European level? 5) How will the new houses help local people when they are going to be way beyond the reach of first-time or even most second-time buyers, and far from public transport? 6) Where are the plans for garden villages? They certainly have not been made public. And what does he say to people living in Bishopstoke, Fair Oak and Allbrook, who would see their villages disappear into a mass of urban sprawl? 7) His party is committed to promoting public transport. 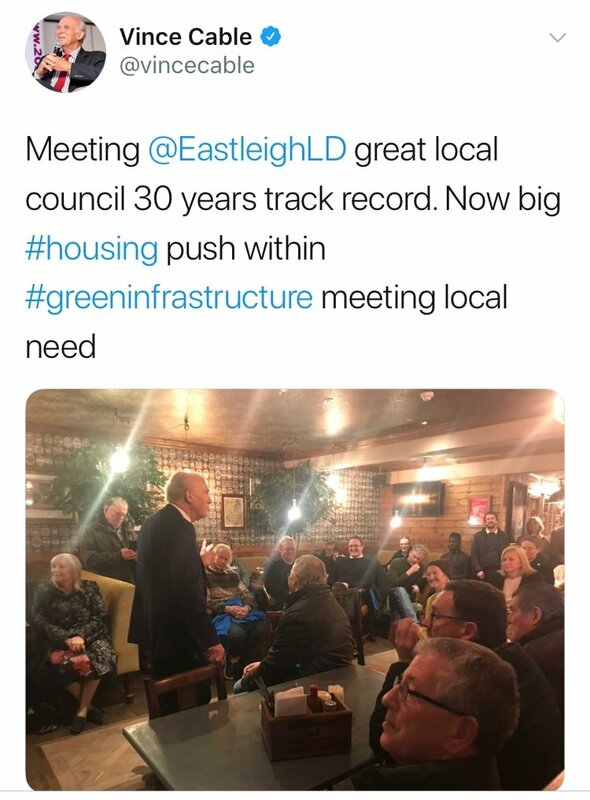 Is he aware that Eastleigh Borough Council has refused to seriously consider the alternative area for providing the additional housing the borough needs – an area which is not only less environmentally sensitive but also nearer to existing infrastructure and, indeed, could be served by a new railway station? The only new infrastructure that the council is planning – a new link road – has been condemned by the Campaign for Better Transport and strongly criticised by Winchester City Council and Hampshire County Council. 8) Finally, has he spoken to the five former Eastleigh Lib Dem councillors who have resigned from the group in protest over the plans – and to party colleagues from Winchester who also strongly oppose them? We have many more questions, but we know Sir Vince is a busy man. We shall send these eight questions to his office requesting a response, and post any reply that we may receive.